During the course of the Old Kingdom (about 2649-2150 B.C.E. 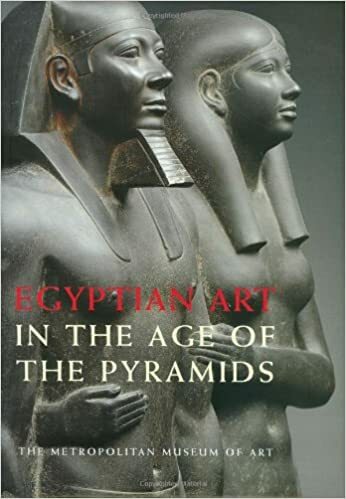 ), Egyptians not only created the pyramid, which has come to stand as an emblem of the civilization, but also defined the essence of their art, establishing a tradition that endured for three thousand years. Centering their attention on the human image but depicting animals, plants, landscapes, and inanimate objects as well, they served their culture's all-encompassing goals of maintaining cosmic order and defeating death. This they did by preserving an idealized image of life in statues and reliefs destined for tombs and temples. Working in a wide range of materials, they were able to express the multiplicity of existence by means of an artistic canon of circumscribed types, which they subtly varied and infused with innumerable realistic details. Keen observation of nature and a thorough understanding of human and animal bodies led to the invention of images of an extraordinary organic truthfullness. Intimate human relationships and impressions of daily life as well as the majestic pharaonic presence are captured in the many forms of their art. Sometimes stark, always straightforward, the images of this early period are graced by what one scholar termed "the charm of the first time." Old Kingdom art first came to light in the middle of the nineteenth century, and explorations marked by many spectacular discoveries have continued to the present. In recent years especially there has been a notable renaissance in studies of the period. This flowering of research has inspired the many authors of this volume, which accompanies a major exhibition of Old Kingdom art held at the Galeries Nationales du Grand Palais in Paris, The Metropolitan Museum of Art in New York, and the Royal Ontario Museum in Toronto. In essays that will enrich the understanding of the general and scholarly audience alike, these internaional experts examine the history of the Old Kingdom, the architecture of royal pyramid complexes and nonroyal tombs, statuary, reliefs, minor arts, and the history of excavations of Old Kingdom monuments. They also focus sharply on the individual works in the exhibition in more than two hundred illuminating entries. The texts are lavishly supported by plans, drawings, and reproductions in color abd black and white of the works in the exhibition as well as comparative material. A chronology, provenances, references, an extensive bibliography, and indexes are provided.